APLC Meet & Greet Session - Feel at Home with Us! The monthly APLC Event organised by Asia Pacific Language Centre (APLC) was held on 3rd September 2015 (Thursday) in Asia Pacific Language Centre (APLC) @ South City Plaza (SCP) from 1:00pm to 2:30 p.m. This time around the event was organised under the theme Meet & Greet and was attended by more than 130 APLC students from across the globe. How was this event different from the usual monthly event? First and foremost, there was the absence of the usual performances and music. 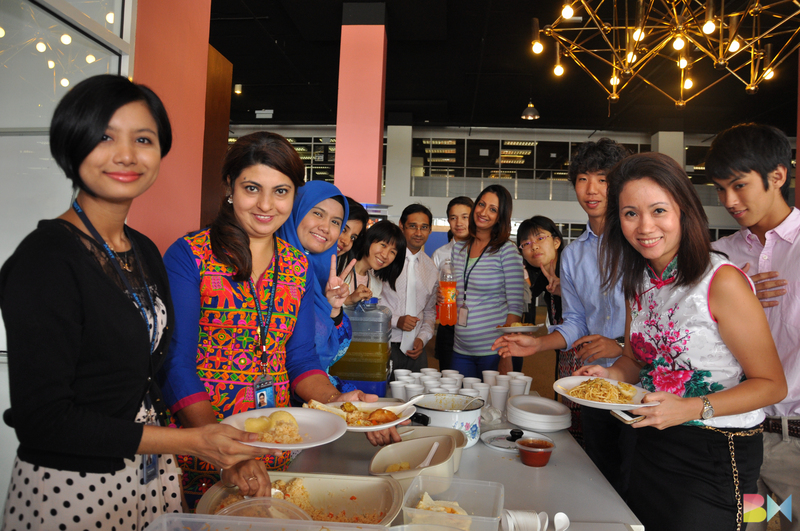 With its simplicity, the event aimed at creating positive opportunities for APLC students to create a network of new friends and also bonding with the teachers ‘Malaysian Style!’ - through delicious home-cooked food by APLC staff and relaxed conversation. To top it off, there was also ample food generously sponsored by APU, thus many came for second and even third helping. Not only that, the event successfully created a lot of space for APLC students to use English while socialising with those from other countries and levels. Going around, one could hear laughter and animated conversations in English as everyone sat together to enjoy the food. To make students feel more at home, APLC staff helped with the food serving and spent time chatting with students on everyday topics, just like what we do when we go to a Malaysian open house! At the end of the day, it warmed the heart to see new friendships developed and language barrier disappeared when students are put together in an encouraging and lively environment such as this event.